As part of Hispanic Heritage Month, Variety and Variety Latino have joined forces to launch the “POWER OF LATINOS: 20 MOST INFLUENTIAL STARS LIST,“ spotlighting the most successful Latino film and TV actors in Hollywood (10 men and 10 women). The special appears in the September 30th issue of print Variety. But rather than focus solely on their professional accomplishments, we went one step further, and looked at how influential and appealing they are within their own community. Known as the “Oscars of Young Hollywood,” the Young Hollywood Awards on July 27 toasted the brightest trailblazing stars in music, TV, and film at The Wiltern Theater in Los Angeles. It was a who’s who of young Hollywood – from Vanessa Hudgens to Ansel Elgort to Justin Bieber – but the one I was most excited about was Gina Rodriguez, our Variety Latino Rising Star of the Year honoree. This fall, Gina makes history as the first Latina lead on the CW with her very own show, “Jane The Virgin,” a heartwarming new comedy about a 23-year-old girl with big dreams who gets pregnant after being artificially inseminated – accidentally! We are so excited about the work Gina Rodriguez is doing in Hollywood and want to recognize that with this honor. She is smart, driven, uplifting, and empowering, and so are the characters she plays on the big and small screen, sending a clear message to Latina girls everywhere that they, too, are represented, and their stories are worth telling, too. Her being the first Latina lead on the CW with “Jane The Virgin” is groundbreaking, but it’s only the beginning. She is someone we’ll be talking about for years to come. Don’t miss “Jane The Virgin” premiering October 13 on the CW. Really proud of this little video I produced for Variety Latino with one of my FAVORITES!!! Miguel invited the VL crew into the LA studio where he’s recording his next album, due sometime this year, and talked to us about so many things, including what it was like to grow up Black and Latino, his kaleidoscopic view of music & art, and…how he lost his virginity! He even sang a snippet of a new song in Spanish called “Destinado a Morir” — which no one’s heard before until now. He loved this interview so much he shared it with his fans via FB & Twitter. And the best part is, we have so much great material from this interview, we’ll be posting more Miguel goodness in the near future! I’ve been busier than I’ve ever been in my life — as in, I forgot what sleep is — but I’m also incredibly proud of the work we’re doing over at Variety Latino, which launched February 27, 2014. Check out some of the other great CELEBRITY INTERVIEWS we’ve done with everyone from Lupita Nyong’o to John Leguizamo. *Miguel’s interview was originally posted on VarietyLatino.com. How did I not know this existed?! Makers: Women Who Make America is a historic video initiative developed by AOL and PBS. It aims to “be the largest and most dynamic collection of women’s stories ever assembled.” And so far, it’s on the right track. Some of the extraordinary women profiled include Madeleine Albreight, Christiane Amanpour, Sandra Cisneros, Hillary Rodham Clinton, Ellen DeGeneres, Tavi Gevinson, Oprah, Sheryl Sandberg and tons more. Among them is Christy Haubegger, Founder of Latina magazine and a personal she-ro. Every day that I worked there from about 2007 to 2011 (a dream come true, for sure) I wanted to make her proud. And that’ll never change, no matter where I go. What she’s built is incredible — and she’s nowhere near done. As big of a power player as she is in Hollywood (she transitioned from publishing to the agency life in 2005 and joined CAA, where she continues to create opportunities for Latinas), Christy always has time to listen, and for that, I’m eternally grateful. This only reaffirms the importance of mentorship for Latinas in any field. Take a minute to watch her profile at Makers.com and I promise you’ll walk away newly inspired! I’m just loving Comida Caliente, a new web series from my friend and executive producer, Stefani Vara. It’s a fun cooking show centered on a matriarch (the hilarious Dene) and her 3 gorgeous daughters (Danielle, Stefani and Diana). I think a lot of Latinos will see themselves in this Mexican American family from Houston. I know I do. Stef was my roommate at CU Boulder, where we were both really useless in the kitchen. Our idea of cooking consisted of making cornbread from a box, busting open a can of refried beans or driving over to Wendy’s. And I don’t know that our sorry asses have gotten much better since, but man, did we have a blast! She taught me about all things Selena and I schooled her on New York hip-hop. I’m just so impressed with Stef and how she put this whole thing together, even getting Goya to sign on as an official sponsor. She’s always been so driven – whether it’s related to her singing career, her modeling, and now, this. Watch these gals heat things up in the kitchen every other Tuesday on the Comida Caliente YouTube channel. My favorite episode so far has been “Sucking Bones,” which is as awesome as it sounds. You may even see me in the kitchen trying one of their recipes (the operative word being trying). Check it out and tell me: what’s not to love about Dene & her daughters? Bossing around Armandito on set. Recently, I scored an exclusive invite to the set of Dancing With The Stars in LA, where Armando Christian Perez (better known as Armandito, or that lil’ chico Pit), was shooting a promo for the upcoming 16th season of everyone’s favorite reality dancing competition. I happily watched as Mr. Worldwide injected everyone in the room with his dose of feel-good energy to the tune of his latest single, “Feel This Moment,” featuring fellow Latina A-lister, Christina Aguilera. Though Xtina wasn’t there, we took the opportunity to ask El Señor Worldwide about how she and all the other iconic Latinas that he’s collaborated with (J.Lo, Shakira, Paulina Rubio, the list goes on and on) have influenced him. He also told us why he thinks people continue to connect globally with his videos, the first artist that made him want to bust a move, why he loves Miami and what his mother, tia and abuelita have taught him about life. Watch the exclusive video at Latina.com and tell me: what do you love most about him? What’s the one accent Gael Garcia Bernal can’t do? Since Almodovar’s Bad Education we know Gael García Bernal can credibly and enthusiastically curse like a Spaniard. Motorcycle Diaries had him doing a young Che Guevara’s subtle Argentine accent. In Rudo y Cursi, he’s the sexiest naco ever. 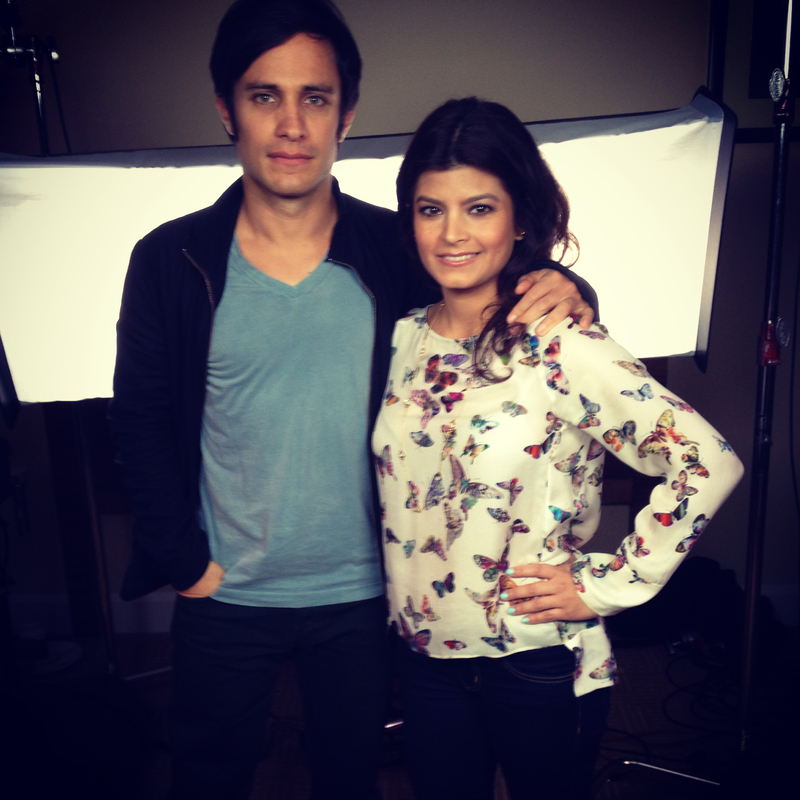 In his latest, NO, out February 15, 2013, Gael García Bernal tried his hand at a not-so-easy accent, that of a native Chilean from Santiago.